Hi, Renxkyoko Iglesias here, reporting for duty. Actually, this blog post is just a reblog of the latest entry on my anime/ manga blogsite HERE. I deem it appropriate, as well, to be posted here on my anything – goes- blog . After all, anything goes here, right ? Well, this is about FYI animation business in the Philippines and the Philippines’ comics culture.. So without further ado…….. I have so much swirling on my mind that I don’t know which one to tackle first…….. Persona 4, the anime, or Chivalry of the Failed Knight ( which I like ), or maybe some thoughts on outsourcing of anime and cartoons from Japan and USA to other Asian countries. On second thought, I guess I’d write a bit about this outsourcing stuff, and Chivalry of the Failed Knight, that is, if I don’t get to write too much on the subject of outsourcing, which is a delicate matter for Americans……. This issue of outsourcing has , in fact, become a contentious subject among political candidates here in the US. These overseas companies are taking jobs away from Americans. To be honest, I believe that, too. Ninety percent of American cartoons are already produced in Asia, particularly in the Philippines, where Warner Bros. for example has set up a full-pledge animation studio, Toei, as well, ( Toei Japan is already based in the Philippines ), , Cartoon Network, Hanna Barbera ( almost 100% developed in the Philippines… Flintstones, Yogi Bear, etc, are made entirely in the Philippines, since the early 80’s ), Nickelodeon, Marvel, Universal Studious , and yes, Disney. Marvel has so many Filipino illustrators in the US that they were allowed to create their own Filipino mutant ( or woman ) . Do you know that girl who can pass thru walls ? And there’s this big-muscled brown supposedly Asian mutant with a Hispanic name …. yep, they are Filipinos ( but not popular, teehee ). Oh, and Wolverine’s illustrator is a Filipino. If the trend continuous, the Philippines may well become the cartoon capital of the world, according to business insiders. American animation companies, though, have been doing this in secret, and that’s quite understandable, given the situation here in the US. This has been going on since the early ’80’s. So guys, you may not like it, but Sailor Moon, One Piece, Slam Dunk, DigiMon, Dragon Ball, to name a few, are made in the Philippines, since the early 80’s. 101 Dalmatians, Tom and Jerry, Little Mermaid ( the TV series) Mickey Mouse, Buzz Lightyear, to name a few, are made in the Philippines, as well, QUIETLY and SECRETLY. However, Filipino illustrators are now clamoring to be recognized in the credits. So, why do they outsource it to the Philippines, particulary from American animation studios ? 1. Besides the obvious one, ( the cost is cut in half ), 2. Filipinos understand Western sense of humor perfectly, and the nuances of the English language. The Philippines was a US colony for 50 years, and that’s why Filipinos get it. And thirdly, and this is most important, ( and sad, in my opinion ) comics has been a part of Filipino culture since the early 1900’s. I’m guessing this is an American influence on the Filipinos’ consciousness. 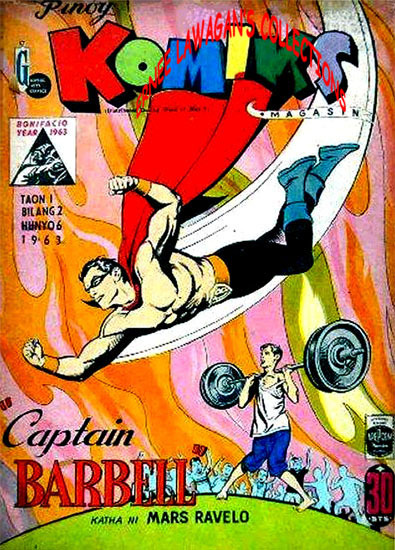 The Philippines had been publishing comics since the early 20’s ( the most famous character since 1926 was Kenkoy, and his everyday life as a Filipino teenager in the 20’s ) , and since then, comics had proliferated. The Philipines, in fact, has been reading manga – like stories earlier than Japan. Some illustrated serials lasted years , and were avidly and eagerly followed on a weekly basis. The popularity of comics ( komiks ) was so widespread that the Philippines became one of the biggest publishers of comics magazines in the world ( second to the US ), pre 1990, after which it waned., and I assume, Japan took over with their mangas. The illustration below is that of Filipino wonder woman DARNA, originally named Varga when it was first published in 1939, then morphed into Darna in 1947.
then as Darna, in 1947, in a nice bikini. Come to think of it, Darna is sexier than American Wonder Woman. Why ? Look at the bottom bikini, It’s high cut, ha ha. Varga ‘s costume to Darna’s… you’ve come a long way, baby. Even in current standard, that costume it’s on the risqué side, don’t you think so ? By the way, Varga came out much earlier than American Wonder Woman. In other words, a Filipino woman’s place in Philippine culture was not typical of that era, especially in Asia. Philippine society is , in fact, matriarchal. Here’s the thing…… I’m not saying Filipinos have comics mentality. Comics that time was a very cheap form of entertainment for poor Filipinos. Farmers taking a break from back-breaking work would seat under a tree and read. There was no TV , and no cinema in remote farming towns. Well, this is all for now, folks. I hope you find this educational. Oh, and please don’t hate on the Filipino illustrators. The meager salary is enough to feed a family and send children to school. * sings * We are the world, we are the children… la la la. Bye and thank you for reading. That’s quite neat. I liked the comics at the end and gosh did Darna lose a lot of clothing. Seems kind of impractical for fighting, lol. Kind of a he-man thing she gots going on there, lol. That is a nice anagram! I was really hoping you guys would find this at least interesting. And , * pondering * the outsourcing is supposed to be a secret. Aaargh. Me and my big mouth. I know, huh. Argh. I don’t want to get them in trouble. Thanks. Just between you and me, ‘k? Did you know‬ that in 1993, Jollibee made a special appearance on one of the pages of The Flash #77? Made by popular artist Greg LaRoque (who was staying in the Philippines at that time), the story “Return of Barry Allen” shows Jollibee and its signature mascot behind the panic-stricken Americans. Ahahaha ! Jolibee, yay ! ! Do you notice Fiipino illustrators style is like that of Marvel’s ? Yes, a little of both, but DC ‘s is too bright, while Marvel ‘s on the darker mood, which is more like Filipinos ‘ kind of illustration. Don’t you guys have Thor ? Oi ! Don’t tell me, there’s a Varga comics to this day ? Hah ! You’re getting educated by a Fil-Am ! o-O Tsk, tsk. Thanks Jiuseppe ! Cheers ! Thank you, too. I’m glad you found it informative. Cheers. The Persona 4 anime is great. A rare example of a good video game adaptation. Have you played the game yet ? wow – this is such interesting, informative and valuable! Dracula with a k? And Darna would make a killer cosplay outfit…but not me!!!! Comics with a k , as well. But, do you know, in Romania, it’s spelled Drakul ? The ” K’ makes it sound more menacing, for some reason. OMG,yeah ! Darna would make a killer cosplay ! ! My favorite is the one with the mother and her kids. I want to know what happens to them ! Anyways, yeah, Captain Barbell is cool. I assume the thin kid who can barely hold on to the barbell becomes Captain Barbell, lol. It’s great to read a bit of history and really be educated on the medium. I hope the Filipino’s working in the industry do get the proper recognition, it shouldn’t matter where people come from, if they are good at their job they should be appreciated. Outsourcing is a problem but with a global world and a government owned by big business it seems less likely they want more jobs as that would mean more businesses and competition. It’s stupidly skewed, cut benefits for the unemployed yet do little about jobs in your own country. Practical solution tax the big companies and give tax breaks to small companies (at least for a few years), get the economy going again and encourage jobs to be created. Globalization is not the problem. It’s when companies move the business to another country, lock , stock and barrel. These are the ones that should be taxed heavily, and their products should be taxed heavily too when they come in as imports. I’m of course conflicted when the Philippines, where I came from. Filipinos are poor, but they are very talented, educated and smart. The Philippines is doing very well, though,with almost 8% growth, the highest in Asia right now, even higher than China. It’s the only Asian country that gave a loan to Greece through IMF. Thank you for nice visit on my blog. I know I’m late but I’m just getting into anime an I enjoy it. Rite now I’m just finishing watching Naruto, an I’m watching the Naruto shippuden episodes on youtube an I love it. And I’m also watching the seven deadly sins on Netflix. Cool stuff! Great ! I highly recommend Moribito . It’s on Netflix, and I ‘ve written about this good anime on my blogsite. Check it out. http://2megaworthitwordpresscomblog.wordpress.com I hope this link works. I’m definitely going to check your website out and thanks for the recommended show or movie. And I’m going to let you know how it is after I watch it. Oh, by the way, I also have Hulu. Hulu has hundreds and hundreds of anime. I also highly recommend Hunter x Hunter. hunter x hunter…. i got you…. i will take a look an let you know thanks much. And Full Metal Alchemist… the second one , which is complete. really interesting hope Filipinos get their fair share of the profit from all that work. Sure and thank you. Cheers.